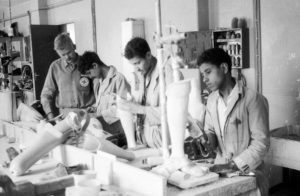 A picture from 1971 showing the ICRC prosthetics workshop in Sanaa, Yemen, from the rich audiovisual archives of the ICRC (picture by M. Convers). Today “the world faces the largest humanitarian crisis since the end of the second world war”, the UN under secretary-general for humanitarian affairs recently declared. This statement shows that humanitarianism is very much alive today, but that it apparently also has a history. But why am I writing about that on a blog related to the history of disability? That is because I participated in the Global Humanitarianism Research Academy (GHRA), organized by the Leibniz Institute of European History in Mainz and the University of Exeter, in cooperation with the International Committee of the Red Cross. Over the span of two weeks in July, spent both in Mainz and Geneva, this event brought together thirteen scholars from all over the world working on issues related to humanitarianism, international humanitarian law and human rights. I was lucky to be one of them, and got inspired to write this short blog about it.